Two evicted Big Brother Naija 2018 housemates, Anto and Khloe will return to the house. Show host, Ebuka Ob-Uchendu had announced that two of the evicted 11 housemates would be returning to the show today. Anto was the last person to be evicted from the show. Since last Sunday that she was asked to leave the show, Anto has remain in South Africa, unlike other evicted housemates who returns to Nigeria 24 hours after they leave the show. While Khloe and K-Brule were disqualified after receiving three strikes for provocation. However, she was spotted on Saturday in South Africa ahead of the Sunday Live show. 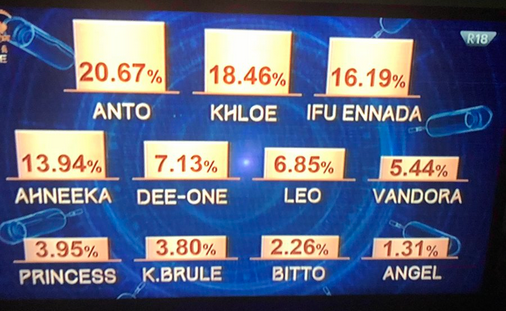 Anto and Khloe got the highest votes from viewers, and that qualifies them to return to the show. The pair will join other housemates by 3am Nigerian time. Ebuka has also announced that all housemates have NO STRIKES. They have hit the reset button on the game. Now there are 11 housemates in the house, competing for the Grand Prize.